About 8 months ago, our household went paperless in the kitchen. It’s been way easier than I thought it would be, and I’ve saved a bunch of money because I haven’t bought any paper towels or paper napkins in that entire time, and I’m not planning on purchasing any in the future. We took a three pronged approach based on our paper usage. I looked at how we were using the paper products: drying our hands and occasional dishes, wiping down the counters, and at the dinner table. So these were the areas I needed to address. Being a Professional Organizer, I tend to get all analytical this way. I’ve done the work for you . . . Create a rag bin with your favorite cleanser. Store it wherever you keep your kitchen cleaning supplies. I keep mine under the sink. It’s just a wire bin I had laying around. It’s full of rags (I don’t bother folding them) and my green cleaning solution spray bottle. 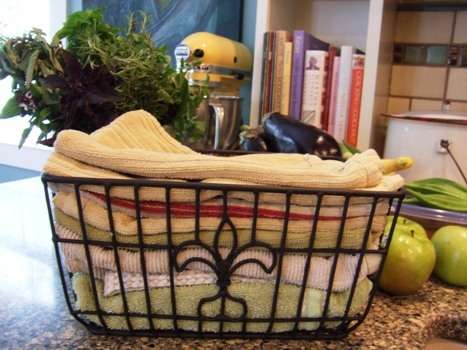 Place a basket on the counter, or choose a drawer in the kitchen, in which to store dish towels. I stocked up from thrift shops, on sale, wherever. For our family of 3, I have about 20. We go through a couple a day and then I throw them in the wash. I keep one towel near the sink, and one over by the stove & kitchen prep area. Set a basket of cloth napkins (here’s the important part) WHERE YOU EAT. Not in another room, or in a drawer. They will be forgotten and it will become a pain. I got half my cloth napkins at an antique sale at Graceworks, and the rest at Our Thrift Store, both here in Franklin. I have ours right on the table where we can grab them when we set the table. The biggest adjustment was the drying of hands. The paper towel holder is right next to the sink attached to the underside of the cabinet. So easy to grab. I leave it empty now. This baffles our daughter’s friends when they come over. There’s a clean, dry dish towel right in front of them and they stand there with dripping hands asking what to do! But now they all get it. Just toss them in the laundry with whatever you are washing and you are good to go! :: Read more articles in our Healthy Living Series. Liz Jenkins, Professional Organizer and owner of A Fresh Space, organizes families and businesses in and around Franklin, TN. Helping people streamline, downsize and rightsize their lives comes naturally to this former teacher and business owner. Living and loving a ‘crunchy granola’ lifestyle, her favorite things are family & friends, books, art, good food & wine, green living, and her label maker. Sign up for Liz’s email newsletter tips, or follow her on her blog, and on Facebook or Twitter. Great ideas, and I plan to try it. My only question is how do you dry mirrors and windows without using paper towels? I love this! Paper towels and napkins are so addictive, not to mention ineffective (think of the messy meals where you need 3-4 paper napkins apiece to stay wiped up!). I keep paper napkins in a cabinet for company because our cloth napkins are badly stained from everyday use, but other than that we’ve gone paperless as well. I am working at trying to do this as well! My only problem is that when we use dishtowels/rags, and I don’t launder them every couple of days, they develop a weird odor that I can’t seem to wash out. Does anyone know what I am talking about (or how I might combat that?) Thank you! I have done this for about a year. I recycled the diaper pail for the wet rags to be thrown into in the laundry room. I also cloth diapered, so I still have wet bags that are the liners for the containers. I highly recommend 2 wet bag liners as you can just throw this in with the towels when they need to be washed and have 1 ready to use while the other is in the wash. If you don’t have a spare diaper pail look for one with a lid that opens easily. I have found going paperless in the kitchen to be a real challenge. I have gone a day without restocking the paper towel holder only to find the next morning that my husband has done it. I have informed him about the decision to go paperless and he’s not to happy about it. I also pointed out to him that we go through 8 big rolls of paper towels a week. I have been keeping a towel on my stove and on my towel rack. I am half tempted to put a towel on the paper towel holder or just take down the paper towel holder. Also my husband LOVES using paper/Styrofoam plates. I keep them on stock for parties and when the drawer is empty he goes to the party supply box to refill. Any suggestions? Amanda – I would calculate how much you are spending a year on paper products and see if the encourages him to change his ways! 🙂 That is really an issue that you will need to work on with him, I think a big help with this is buy in from the family. But the big help would be not to purchase them at all. Then they have no choice but to use the cloth towels. Amanda, put your foot down. Don’t bother even getting disposables for parties or otherwise. If you want to go paperless for everyday why bother changing that when you have a party? Start amassing a party collection of reusables. Buy a few here and there. I recently hosted the family Thanksgiving for my husband’s family followed by Christmas for my family and on the tails of that was a New Years Eve party for my sons and their friends. At each of these parties there was an average of 40 people. Needless to say some who were unaware of my aversion to using disposables were surprised to see “good plates” and “good napkins” used for a party. Actually I think it’s silly to spend money on trash.- The dishes were down right cheap! They were $8 for a set of 12 white dinner plates at walmarts,matching dessert plates and clear drinking glasses were the same price for a set of 12. Over time I bought enough to service about 75 people (the max I have room to host) I don’t buy sodas we have iced tea or punches made from fruit juices and fruit. Yes, I use old fashioned punch bowls and punch glasses. I noticed too that with regular dishes instead of disposables guests seemed to be more conscientious of where they left the glass- no mysterious glasses full of drinks laying around untouched on the woodwork without a coaster like there used to be when we used disposables. For storage I don’t use plastics I old fashioned reusable canning jars (mine are freezer safe). To keep germs at bay especially in flu season we actually use a basket of face cloths in the bathroom to dry hands on. Once it is used by one person it’s put in the hamper (prevents cross contamination). The amount of money you save by not using disposables is incredible if you take the time to add it up! Save the planet for our kids and save your wallet at the same time! !